Keywords: Ovarian cancer, BRCA, homologous recombination, PARP inhibitor, DNA repair, apoptosis. Keywords:Ovarian cancer, BRCA, homologous recombination, PARP inhibitor, DNA repair, apoptosis. Abstract:The standard of treatment for advanced ovarian cancer is represented by optimal surgical debulking preceded or followed by chemotherapeutic regimens including taxanes and platinum agents, possibly associated with bevacizumab and/or intraperitoneal therapy. Despite this comprehensive treatment strategy, almost 75% of patients relapse or progress and are therefore candidates for a second-line treatment, showing, at this point, less chemo-sensitivity and worse prognosis. An interesting approach to improve outcomes of these patients has been developed in the last decade, in BRCA-related ovarian cancer. 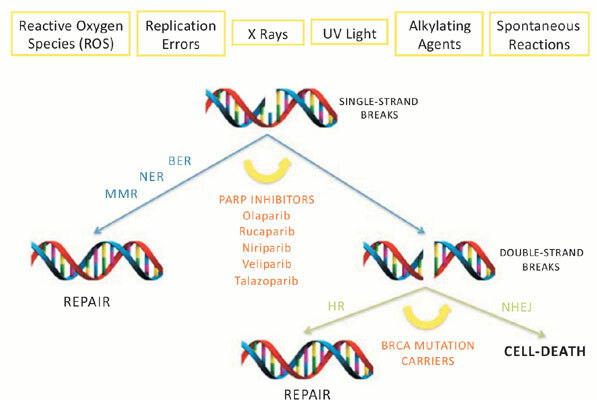 Mutations in one of the BRCA genes result in impaired homologousrecombination DNA repair, which causes genetic abnormalities that promote carcinogenesis. Interestingly, this defect has been exploited by the introduction of poly (ADP-ribose) polymerase (PARP) inhibitors to provide specific cancer cell cytotoxicity. Particularly, the inhibition of PARP in BRCAmutation carriers leads to the persistence of DNA damage usually repaired by the homologousrecombination system, resulting in cell cycle arrest and thus apoptosis. Despite the mechanism of action, an activity of PARP inhibitors was also observed in “BRCAness” ovarian tumors, and in BRCA-related tumors other than ovarian, suggesting that these agents may be active regardless of BRCA mutation status or site of origin. This review aims to describe the principal evidence that led to the development and the study of PARP inhibitors and to discuss their main implications in our daily clinical practice.